While living in New Jersey during rabbinical school, I attended a benefit dinner for the Jewish Theological Seminary (JTS) in which Senator Jon Corzine was honored. Prior to the event, questions were raised as to whether it was wise of JTS to honor a politician while he was serving in office. Honoring Corzine, the former Goldman Sachs Chairman and who after serving as senator became the governor of New Jersey, would bring in a lot of contributions to JTS, but it also upset several donors who saw this as the Seminary engaging in partisan politics. Now the local region of the Seminary here in Michigan is honoring not one, but two politicians. And yet, there won't be any objection to this event because of the reputations of the politicians who will be honored. 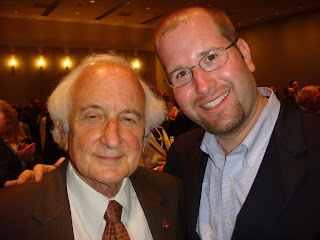 In the Detroit Jewish community, Carl and Sandy Levin have earned their "Favorite Sons" status over a combined sixty-plus years in elected office. The Jewish Theological Seminary will honor the Levin brothers at a brunch on Sunday, April 18, 2010. 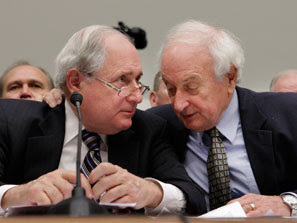 The Levin Brothers are making big news today, following yesterday's decision of House Democrats to make Sandy Levin acting chairman of the House Ways and Means Committee. Today's Detroit Free Press reports that Sandy's "ascension, taken with his younger brother Carl's chairmanship of the Senate Armed Services Committee, creates what the Christian Science Monitor called 'one of the most powerful brother acts in Washington since the Kennedys.' The Office of the House Historian said there have been four instances of brothers serving as chairs of congressional committees at the same time but none since 1881. And there is no precedent for brothers chairing committees as powerful and prestigious as those headed by the Levins." A few months ago, PBS aired a documentary about the history of Jewish Detroit in which Sandy and Carl Levin were interviewed together about their beloved neighborhood in the City of Detroit. Their interview was a touching tribute to their upbringing and the city they love. Many described the scene not as two elected officials being interviewed by a documentary filmmaker, but as a couple of local Jewish grandfathers waxing nostalgic about their childhood and the old neighborhood. I first got a sense of Carl Levin's character when a good friend of mine worked on his re-election campaign as a fundraiser. I would hear her tell people that she works "with Carl" as opposed to "for Senator Levin." However, that is precisely what the laid back senator wanted his staff to say. While he's served in the Senate since 1979, there's no ego there. Both Carl and Sandy are humble, well-respected men who can be aptly characterized by the term "mensch." I've met both men on several occasions and have found them to be warm and friendly, without a hint of that "Inside-the-Beltway Braggadocio." Most people don't know that in addition to all of his accolades and accomplishments in the Senate, Carl Levin also founded a synagogue. A February 11, 1977 article in the Detroit Jewish News reports that when the former synagogue building of Congregation Mogain Abraham in Detroit was about to be demolished, Carl Levin (Detroit Common Council President at the time) and three others salvaged relics from the 63-year-old building to be incorporated in the new synagogue they formed called Congregation T'chiyah. "When Levin became aware that the former synagogue of Mogain Abraham (now Mt. Olive Baptist Church) was to be demolished as part of the Medical Center Rehabilitation Project, he proposed that the group make a bid to the city, which had purchased the structure, for the interior fixtures... the bid was accepted." Years later, Carl Levin was walking in Detroit when he saw a pickup truck drive by with a stained-glass window in the back. He immediately recognized it as one of the windows from the synagogue, which was now a church. Even though, Congregation T'chiyah technically owned that stained-glass window, which had apparently been stolen out of the church, Carl stopped the truck and bought the stained-glass window from the man right there on the spot. Today, I'm proud to be the part-time rabbi of Congregation T'chiyah; probably the only synagogue in the country to be founded by a U.S. Senator. 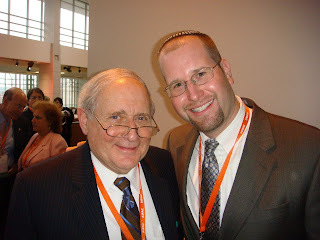 I'm also honored that Sandy Levin's family is active in the congregation, continuing the Levin legacy at Congregation T'chiyah that began over thirty-three years ago. I'll be among the many who will come together next month to honor Sandy and Carl Levin, and to support the Jewish Theological Seminary. With many politicians today, people seem to just be waiting for a scandal to occur. That is not the case with the Levin Brothers. Through their integrity and decades of hard work, they have actually made strides to give politics a good name. They are just two nice Jewish boys from Detroit who earned law degrees and set out to make a difference by legislating in Washington in a non-politics-as-usual way. Actually, this is not a comment regarding your article (even though I've enjoyed reading them), I rather have a general question that I was curious about. I'm actually a Christian Pastor. I had a question about the teaching of the ancient Rabbis. I was told that in their style of teaching, when they were listing a series of points, that the last point was always the most important one, whereas, we often make the first point our main point. In your knowledge, is that true or false? Thanks for your future answer. I can be reached at askingpastordon@msn.com .